← Corn’s-A-Comin’ to a Town Near You! The few film schools that still offer classes in 16mm production tend to warn their students that it takes a patient person to work with the medium. Unless you’re in California or New York, it takes several business days for your film to be processed and printed, and if you’re lucky enough to work with optical printers, that crossfade you can drop in in Final Cut Pro in a few seconds can take a few hours to set up and execute. 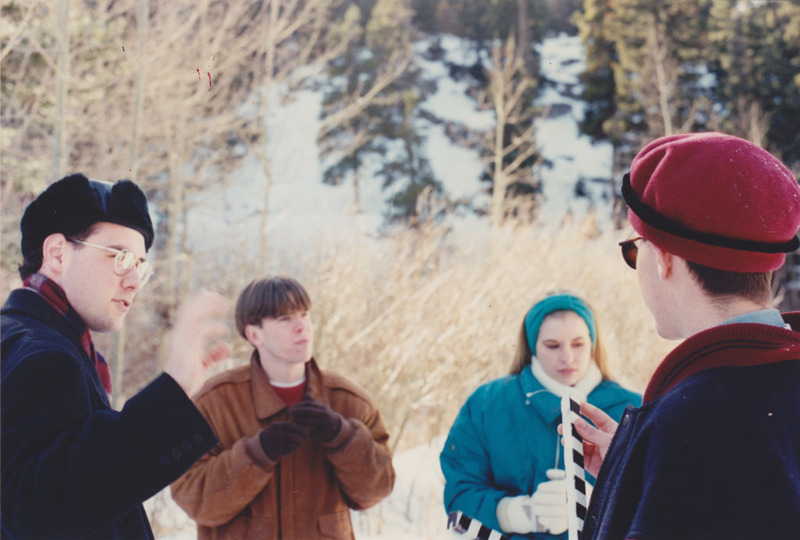 It takes a patient person to work with film, but it takes an even more patient medium to work with Rob Christopher, who shot his feature film PAUSE OF THE CLOCK on 16mm in 1995. Since then, the negative, workprint, and soundtrack have been traveling with him from one apartment to the next, eagerly awaiting their final cut. We talked with Rob about what it’s like trying to finish a film he started twenty years ago, now that you can watch and make motion pictures on your iPad. NWCFS: When you first started to revisit PAUSE OF THE CLOCK, what kind of shape were the film elements in? Did you have everything fairly well-organized or were you dealing with piles upon piles of uncataloged film? Rob Christopher: I was very, very fortunate. I not only had all the reels of my rough cut in one place, but (more importantly) all the camera negatives too. The negatives were still in their plastic bags and boxes, the ones that came straight from the lab. So when it came time to scan the negatives, there wasn’t the need to do any heavy duty cleaning or restoration [other than some fairly standard dustbusting]. When all the scans were done I did my logging all over again, marking scenes and shots and takes and all that. But I would have done that anyway, since it had simply been so long since we shot everything. And I’m making a different film than I was back then. However it wasn’t all sunshine and roses. I never could find a final, complete version of the script. And I discovered that, probably since the production spanned about 15 months, the way we had ended up numbering the scenes didn’t make any sense. But most alarming of all, some of the sound was missing! Just gone. An entire reel of Nagra tape of on location sound had vanished, probably left behind at one of the apartments I’ve lived in since 1997. I thank my lucky stars that I’d held on to my rough cut all those years, because I was able to rescue the most important parts of that missing sound from one of the mag reels. After my sound designer Matt Trifilo has his way with it, you won’t even be able to tell. NWCFS: What labs did you use to process your original camera negative and what film stocks did you shoot on? RC: I’d say that 95% of it was done by Du Art. My cinematographer Tchavdar had finagled a pretty good deal with them, so we were shipping everything to New York for processing and dailies. I think we used Astro here in town for a few of the MOS rolls. We pretty much shot on every type of film that was around. Good thing I still have the camera reports. It’s a melange of Kodak, Fuji and Agfa. Looks like a lot of Kodak 7287, 7293, 7298. Tchavdar and I were both kind of love in Fuji at the time. A Christopher Doyle/Wong Kar-wai thing. So we used some 8660, 8621. But for every filmstock we chose on purpose, there was one we used because it was a short end of something from a previous shoot that was either very cheap or free. NWCFS: Independent film distribution has changed dramatically in the past 20 years, can you talk a little bit about what your goals for the film were when you shot it vs. what your expectations are now? RC: At the time it was like, okay, rough cut on 16mm, fine cut on 16mm, conform the negative, make an optical track, then answer print and release print. And do telecine and then make a whole lot of VHS copies to send out to festivals along with your press kit. It was always about trying to get it shown at festivals. And the interesting thing is, the steps in the process may have changed, and the tools, but it’s still all about getting into festivals. Actually getting any so-called theatrical distribution nowadays, it’s like chasing a mirage. Maybe it happens, but it’s not wise to bank on it. So playing at festivals *is* your distribution. It clarifies things in some ways. I do believe that PAUSE OF THE CLOCK will work best when it’s up on a big screen in a darkened theater, with people sitting together and watching it. So that’s what I’m aiming for. This is not an iPad movie. I’m making the very best film I can, and then doing everything I can to put it out there, and then que sera sera. NWCFS: The dialog about independent film now is that you can make great feature films for very little money thanks to affordable digital cameras, but there’s such a rich history of great independent films being shot on 16mm for peanuts (MALA NOCHE, PERMANENT VACATION, SLACKER … to name a few). How were you able to fund production of the film pre-video and pre-Kickstarter? Can you talk a little bit about the budget for your shoot? RC: I got this great book, Feature Filmmaking at Used-Car Prices, by Rick Schmidt. From my parents. So that really got me fired up, and when I decided I was going to do this thing, they were the first people I asked for money. And then grandparents, aunts and uncles. A lot of Christmas and birthday checks went into the movie. I was like, “Don’t get me presents, send me a check.” I asked everybody. I hit up some of my teachers from junior high and high school, and got some money that way. The youth pastors from my old church back in Colorado, and a guy I knew from the church I was going to here in Chicago. It involved a lot of long-distance phone calls and letter writing. My lead actor, Dylan, who was also my roommate, floated me a loan for like a year. And then, at a crucial moment towards the end of shooting, I was awarded an Albert P. Weisman Award from Columbia College. That allowed us to finish. In the end, the total production budget was less than $10,000. NWCFS: I read that Rick Schmidt book, too. There’s a lot in it that’s still relevant. What really got me was the somewhat terrible but also gutsy advice about putting as much as you can on credit cards. I like the all or nothing approach. There was also the idea that you could offer “shares” of your movie’s profit in exchange for labor. Do you have any outstanding IOUs or was everything pretty much no-strings-attached? RC: Most of the money was no strings attached, but a handful of people actually became investors. So if and when the film recoups its costs they’ll get repayments with interest. After more than 20 years that’ll be a nice surprise! NWCFS: What got in the way of completing the film in the ’90s? RC: When the last shot was in the can in May of 1996, I was completely exhausted. Creatively I ready to start editing, but I just could not face restarting the whole fundraising merry-go-round. I had no idea where more money would come from, no clue. And after the shooting was over, the whole team dispersed. I did get about 2/3 of the way through a rough cut. But the momentum was gone. And then, before I knew it, it was Graduation Day. And time to, you know, make a living. On top of that, all that free and easy access to equipment that I’d had in college was taken away. Also, it was around this time I realized that writing was much, much cheaper and more gratifying. I started focusing more on that. So the movie just fell by the wayside and I moved on. It’s not like anyone was really breathing down my neck, pushing me to finish. NWCFS: Had you made any short films before ​PAUSE OF THE CLOCK, ​or was this your first project as a director? RC: I had made movies on video (and I mean, VHS) all through junior high and high school. My school district had this offline VHS editing system that I learned to use inside and out. When I was 14 I made this sci-fi opus called DESPERATION, about 90 minutes long. Very TWILIGHT ZONE. Then there was It’s All Too Much, a compilation of comedy sketches and music videos. And later, into my freshman year at college, I made two 45-minute pieces, Ambient Storytelling 1 and 2. Collections of people telling stories to the camera, intercut with evocative landscape footage. Brian Eno on the soundtrack. They got screened in a few places. When I finally able to get my hands on 16mm equipment, “real movie” equipment, I was infected by delusions of grandeur. Why make a short when you can make a feature? NWCFS: Were there any filmmakers working on 16mm in Chicago (or in general) that were particularly influential or inspiring? Was there anyone making films at the time that made you feel it was possible to do it yourself? RC: Like I said, Rick Schmidt’s book was really inspiring. I had had this great teacher my freshman year at the Art Institute, Cezar Powlowski, who got a lot of us excited about making movies. Later, when I transferred to Columbia, my faculty advisor was really supportive. Dan Andries. And though his films couldn’t have been more different than what we were aiming for, I loved all of Tom Palazzolo’s stuff. So, so Chicago. In the larger world, most of my influences at the time were older movies. Godard and Cassavetes. But Soderbergh was certainly on my mind, especially KING OF THE HILL. I often thought about what David Lynch went through to make ERASERHEAD. NWCFS: One of the stretch goals for your Kickstarter fundraiser is making a 16mm projection print. Why is that important to you? What’s the workflow like? RC: Firstly, that’s how we conceived the film. Namely, as a film. A reel of celluloid projected onto a screen. I know that PAUSE OF THE CLOCK will look its best when seen that way; and doesn’t every filmmaker strive for the best possible viewing experience? Not that it’s always achievable. The cold, hard truth is that most people are going to see this movie digitally. I thought long and hard about my workflow before (very, very reluctantly) deciding to go that route. Had I access to about $10,000 more, I definitely would have conformed the original negative, THEN done color correction, THEN done a scan for digital/DCP & answer print & release print. But alas, I must do things the cheaper way for now. Though it’s not my preference, it’s not all bad either. 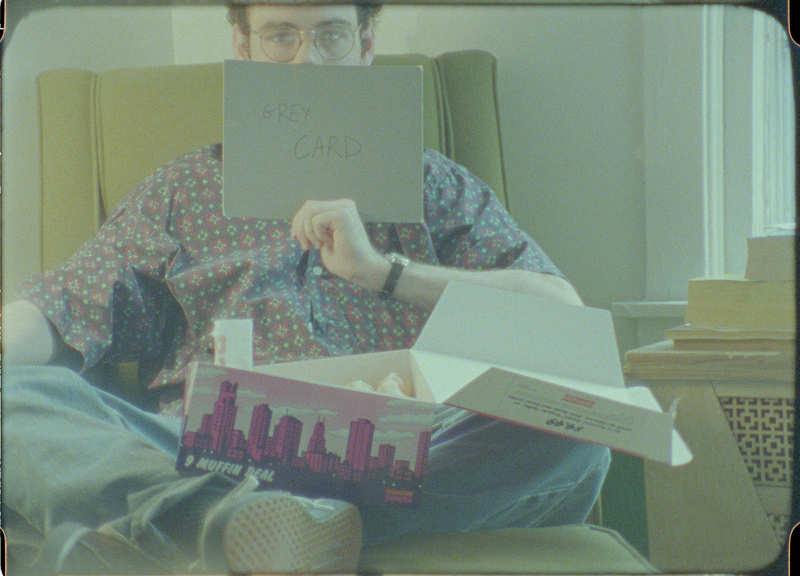 The camera negatives were scanned at about 2.5K, and once all the final color correction is done digitally I’ll be doing a film out from that to 16mm. Looking on the bright side, that wonderful 16mm look has been preserved in the scan and I certainly won’t be doing any smoothing tricks to try to erase the grain. It’s gonna look like dynamite. But, to get back to your question, the second and possibly more important reason for creating a 16mm print is for preservation. I really don’t think that today’s “born digital” filmmakers are truly cognizant of what’s going to happen to their movies in the future. Those ones and zeros can be dangerously fickle; and then, where’s your movie? A DCP is not archival. An Adobe Premiere Pro project is certainly not archival. Regular file migration seems like a stop-gap solution at best. A good film print is really still the best way to ensure that the movie’s still viewable, long term. 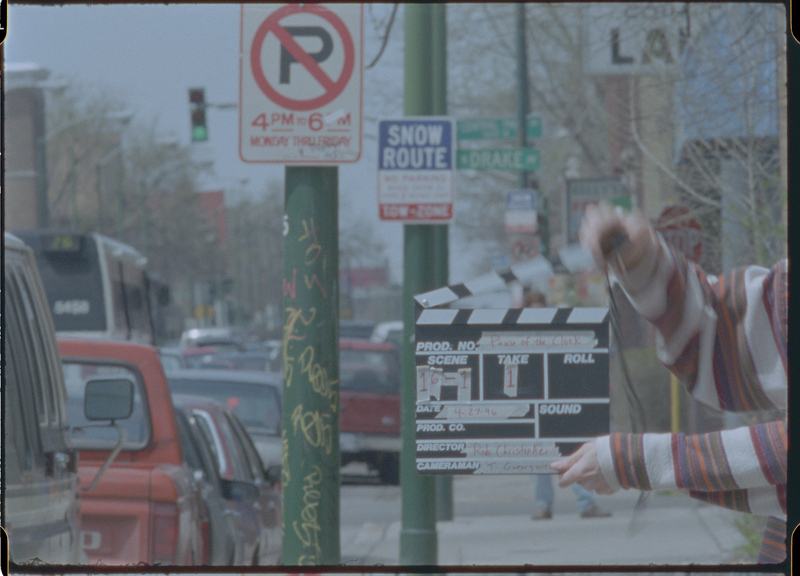 I am very fortunate that my original elements are on film too, so God forbid something happens I can go back to those. If we had made PAUSE OF THE CLOCK on some crappy, early digital system and 20 years later I’d decided to pick things up again and finish it? Wouldn’t have happened.